Drag the words over the center of the appropriate image. If it's right the background will turn a color, otherwise it will stay where you dropped it. Pictures courtesy of Prentice Hall. sedēre caupō speculum māne stāre servus pectere ancillae sordidus pernoctāre sedēre: Aurelia sits. caupō: innkeeper is there. speculum: slave holds mirror. māne: it's early. stāre: all stand around. 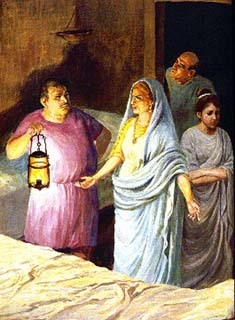 servus: a slave is on duty. 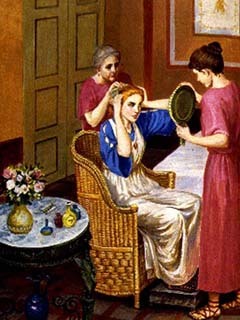 pectere: they comb hair. ancillae: slave women help. sordidus: the room is dirty. pernoctāre: stay the night.